Fame and celebrity can sometimes be very fragile and fleeting. One moment they’re here, next minute they’re gone. One moment the adoring masses are tearing your clothes off because they love you, next they’re burning you in effigy because they hate you. For popular matinee idols, sports stars, politicians, and rock musicians, public pirouettes in adoration can come rather sharply. In fact, sometimes, an adoring public following or fan base will pivot en masse, turning on its idols for something they have said or done. Often it’s for trivial reasons. But sometimes it’s more serious and the reaction is explosive – and in these cases, the cause is sometimes due to an insensitive comment made in sensitive territory; a verbal trespass that touches a raw nerve on matters of class, race, religion, politics, or civil society. For the Beatles — the famous British rock`n roll band of the 1960s –the pivot of the masses from adoration to something closer to hate came by way of that most sensitive of topics: religion. The controversy first broke in the U.S. in late July 1966, right before the Beatles were slated to begin a major 14-city North American concert tour. However, the beginning of the controversy had its origins months earlier, back in London, England. It all began in March 1966, during one of hundreds of media interviews the Beatles had given on their rocket ride to international stardom and pop music fame. In this case, it was John Lennon being interviewed by Maureen Cleave a reporter with the London Evening Standard. Cleave, in fact, was also a friend of Lennon’s, and John had agreed to be interviewed by her at his home for a Beatles series she was planning. Cleave’s series would eventually run in four parts, one for each Beatle. During the Lennon interview, and in the writing of her article – which appeared on page ten of the London Evening Standard of March 4, 1966 – a paragraph written by Cleave described Lennon’s views on religion, noting at the end of the graph, that Lennon was then reading a lot about religion. March 4, 1966: Portion of the original London Evening Standard newspaper story & layout interviewing John Lennon about his life as a Beatle, in which he made remarks about religion and Jesus, which weren’t given any special attention by the paper, nor did they bring any noticeable reaction from British readers at the time. 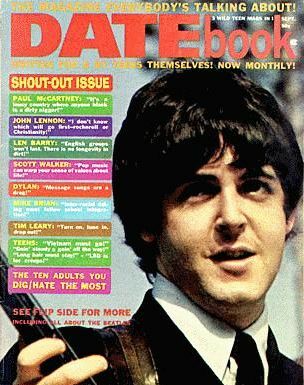 Paul McCartney on Sept 1966 “Datebook” magazine cover, which also featured story on Lennon’s remarks about Jesus. In the Evening Standard article, Lennon’s remarks on Jesus and religion were not given any special attention, used as a pull quote, or accorded any other special treatment. In fact, after that story ran in the U.K., there was no wild popular reaction to Lennon’s remarks. Nothing seemed to have come of it. 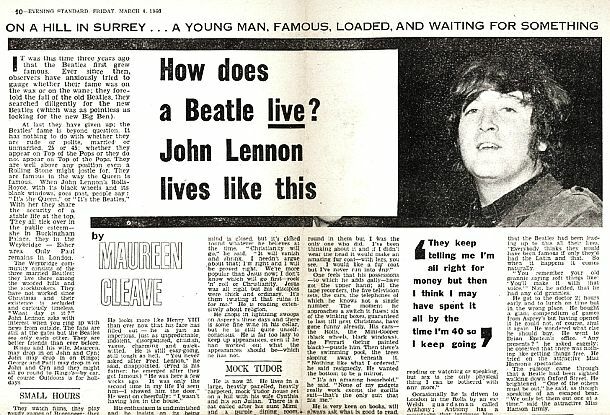 Then, five months after Lennon’s interview with Cleave had appeared in London, parts of the same interview were scheduled to be republished in the September 1966 edition of the American teen magazine, DATEbook. However, some of the DATEbook material appears to have been released ahead of newsstand arrival and reached the American media by late July 1966. When the magazine’s final edition hit the newsstands in September (shown at left) – with Paul McCartney on the cover – it also used a tagline that ran second in a column of multi-colored taglines on the left side of the cover, quoting Lennon’s remark: “I don’t know which will go first — rock `n roll or Christianity.” That line was also used as the headline for the story that ran inside the magazine. 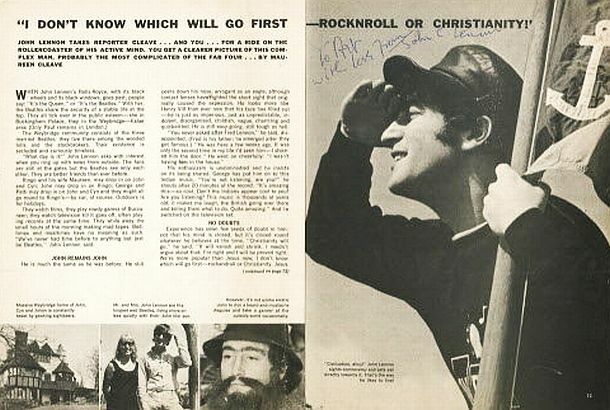 Two-page layout of the September 1966 “DateBook” magazine article on John Lennon (from the March 1966 London Evening Standard) using the headline, “I Don’t Know Which Will Go First – Rock `n Roll Or Christianity”. Lennon’s comment, in context, was an observation about religion losing its connection to youth. It was taken, especially in the South, as an anti-Christian boast. 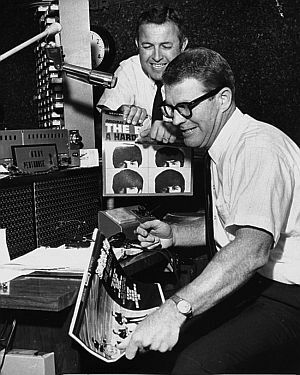 July-Aug 1966: Birmingham, Alabama radio disc jockeys, Tommy Charles, top, and Doug Layton, right, of WAQY, ripping up Beatles record albums and other materials. By Sunday, July 31st, 1966, two disc jockeys at radio station WAQY in Birmingham, Alabama – Tommy Charles and Doug Layton – had read the DateBook story, became outraged by Lennon’s remarks, and kicked off a drive to ban the Beatles music from the airways. Their radio station would no longer play records by the Beatles, they said – the British group who “grew wealthy as the music idols of the younger generation.” The DJs encouraged listeners to throw away or burn the band’s records. They called for a “Beatles Burn-In,” to be held around the time the Beatles tour was to arrive in nearby Memphis, Tennessee. 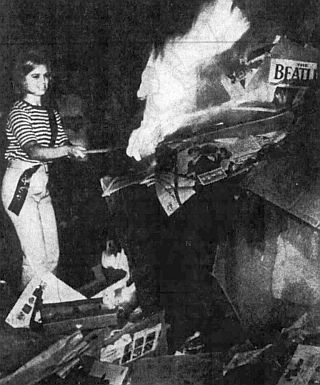 The photo at right shows the two Birmingham disc jockeys, Tommy Charles, upper left, and Doug Layton of Radio Station WAQY, ripping up and breaking Beatles record albums and other materials They are credited with starting a “Ban the Beatles” campaign, which would spread to other stations and protest actions. Charles in particular took exception to Lennon’s statement as “absurd and sacrilegious.” He went on to say, “something ought to be done to show them they cannot get away with this sort of thing.” Charles then began making spot broadcast announcements on the air every hour urging WAQY’s audience to turn in their Beatles records, pictures, magazines and souvenirs for a Beatles bonfire. Other radio stations would soon follow suit. And the anti-Beatles sentiment grew from there. 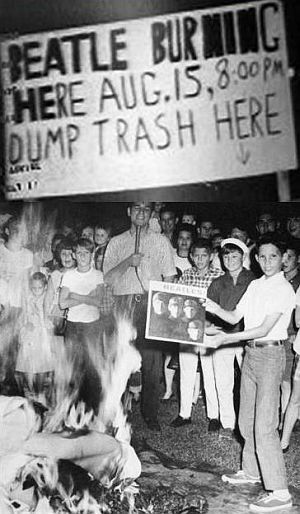 Overnight, it seemed, teenaged Beatles fans in states like Georgia and Mississippi turned out to smash records and throw their Beatles paraphernalia on bonfires. August 4th, 1966: United Press International story on Beatles radio ban, appearing in a Camden, New Jersey newspaper with headline, "DJs Ban The Beatles for Lennon Remarks." Meanwhile, a spokesman for Capitol Records, which then distributed Beatles recordings in the U.S., had already issued a statement explaining that Lennon was “quoted out of context and misconstrued.” Rather, Lennon was being “conjectural” on the topics of Christianity and rock `n roll, said the spokesman, and “only intended the broadest comparison…. He definitely intended no irreverence.” Nonetheless, the radio bans of Beatles music continued. August 4, 1966: “The News and Observer” newspaper of Raleigh, North Carolina ran the headline,“Stations Ban ‘Sacrilegious’ Beatles,” for its story about radio bans of Beatles music in reaction to John Lennon’s remarks. “Anyone making a sacrilegious remark like that has no place on our station,” said George Nelson of WRNB in New Bern, North Carolina, quoted in Raleigh’s News and Observer August 5th, 1966 story, announcing his station’s ban. Bob Latham of station WTYC in Rock Hill, South Carolina reported a telephone poll of 177 supporters of his station’s Beatles ban, as opposed to 10 who wanted the group’s music continued. Another station using a poll to decide on a Beatles ban was WORG of Orangeburg, South Carolina, which found 144 in favor and 2 opposed. Bobby Dark of radio station WYNA of Raleigh, North Carolina reported that his station had a Beatles bonfire scheduled. According to the News and Observer, as of August 4th, among other stations then banning Beatles music were: WKDK of Newberry, South Carolina; WLSC of Loris, South Carolina; WPET of Greensboro, North Carolina; WBBB of Burlington, North Carolina; WVCB of Shallotte, North Carolina; WRKB of Kannapolis, North Carolina; and WTYN of Tryon, North Carolina. August 6th, 1966: Beatles manager, Brian Epstein, holds NY press conference in attempt at “damage control” re: Lennon remarks. Press: We’re wondering whether you’re going to change the itinerary of The Beatles to avoid areas where the radio stations are now burning their records and their pictures? Epstein: This is highly unlikely. I’ve spoken to many of the promoters this morning. When I leave here, I have a meeting with several of the promoters who are anxious that the concerts should not be cancelled, at all. Actually, if any of the promoters were so concerned and wish that the concerts be cancelled, I wouldn’t, in fact, stand in their way. 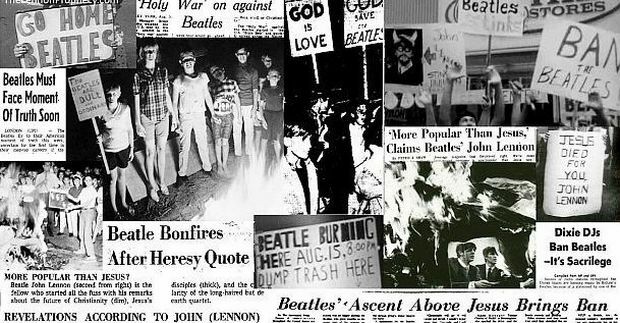 August 1966: Collage of some of the newspaper headlines, Beatle protests, and “Beatle bonfires” that erupted in the U.S. following John Lennon’s “more popular than Jesus” remark, republished in ‘DateBook’ teen magazine. There were also reports of protests in Spain, South Africa, Costa Rica, and other locations. Yet the U.S. reaction, also covered by the world press, was the primary focal point, especially since the Beatles were about to begin their American tour. August 1966. 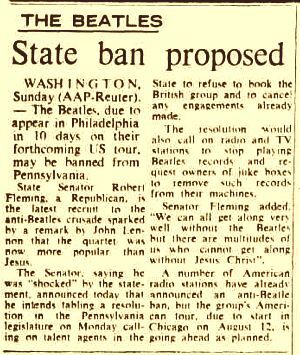 AAP-Reuter wire story about Pennsylvania legislator who sought to ban Beatles music and performances in the state via a proposed resolution. In Pennsylvania, state Senator Robert Fleming, a Republican, said he was “shocked” by Lennon’s remarks, and announced he would offer a resolution in the Pennsylvania legislature on August 8th calling on all talent agents in the state to refuse to book the Beatles and to cancel any engagements already made – as one in Philadelphia was already scheduled for the Beatles’ planned tour. Senator Fleming’s resolution also proposed contacting radio and TV stations to request they stop playing Beatles records and that owners of juke boxes also remove Beatles records from their machines. “We can all get along very well without the Beatles,” Fleming was quoted as saying in a AAP-Reuter news story, “but there are multitudes of us who cannot get along without Jesus Christ.” Fleming’s resolution was not approved. In Boston, too, state representative Charles Iannello, a Democrat drafted a petition to be offered in the Massachusetts House of Representatives, for the city of Boston to revoke the Beatles permit for their scheduled August 18th show at the Suffolk Downs race track venue. “Who are these four creeps to put themselves above the High and Mighty”, Iannello asked. “Do you think they will do anything for the morals of out teenagers? We’ve got enough problems.” Iannello, however, was unable to obtain a suspension of House rules to permit the introduction of his petition. In Indiana, meanwhile, there was a Catholic youth group organizing a Beatles burning, and other such protests were in the offing elsewhere. For the Beatles, however, then in their third year of international acclaim, the troubles of 1966 – and their forthcoming concert tour – would contribute to a major shift in their career. A combination of forces would be at work on the group’s thinking, and would not fully form until the end of the tour. As it was, they were already evolving from the “she-loves-you” style of music, to more sophisticated compositions. The release of their Revolver album – their seventh studio album – would set something of a new standard once it was digested by fans and critics. However, that album – released on August 5th in the U.K, and August 8th in the U.S. – came just as the furor over Lennon’s remarks were spawning protests in America. August 1966: Roadside sign along route 93 near Hazelton, Pennsylvania expressing disapproval with the Beatles, then in reaction to John Lennon’s “more-popular-than-Jesus” remarks. So sitting in London and hearing about the outrage in the States over Lennon’s remarks, the Beatles must have certainly thought about cancelling their tour. This would be their third trip to America in as many years, having arrived to wild acclaim in 1964, the year they first broke out, and again during their 1965 American tour. But now, as they contemplated coming to America for their August 1966 tour in the wake of the heated reaction to Lennon’s remarks, they surely had concerns about coming. Still, they came. But now, their popularity and staying power would be tested in ways they had never experienced before. August 11, 1966: John Lennon of the Beatles, center, is flanked by George Harrison, left, and Ringo Starr as he apologizes for his remark that "the Beatles are more popular than Jesus," at a Chicago news conference. Associated Press wire story reporting on John Lennon’s August 11, 1966 apology. Later that same evening, in fact, August 11th, 1966, in Chester, South Carolina, the Ku Klux Klan (KKK) held a “Beatle Bonfire” at a cross burning. The Associated Press photograph below shows South Carolina KKK Grand Dragon, Bob Scoggin, tossing Beatles records into the fire. Still, the Beatles hoped for the best as they began their tour. August 11, 1966: South Carolina KKK Grand Dragon, Bob Scoggin, tossing Beatle records into the fire of a burning cross at Chester, South Carolina. Photo, Associated Press. Their theology didn’t matter. The Beatles were in town and teenagers were in ecstasy. Beatle fans who had forgiven or forgotten or who were unconcerned about John Lennon’s reported statement that his group was more popular that Jesus, streamed into the 13,500 seat International Amphitheater…. A throng of screeching youngsters greeted Britain’s Beatles in Detroit Saturday in what appeared a second American vote of confidence for the controversial mopheads. Not deterred by the story of protest kicked up recently by Beatle John Lennon, an estimated 30,000 fans bought tickets for two performances here. 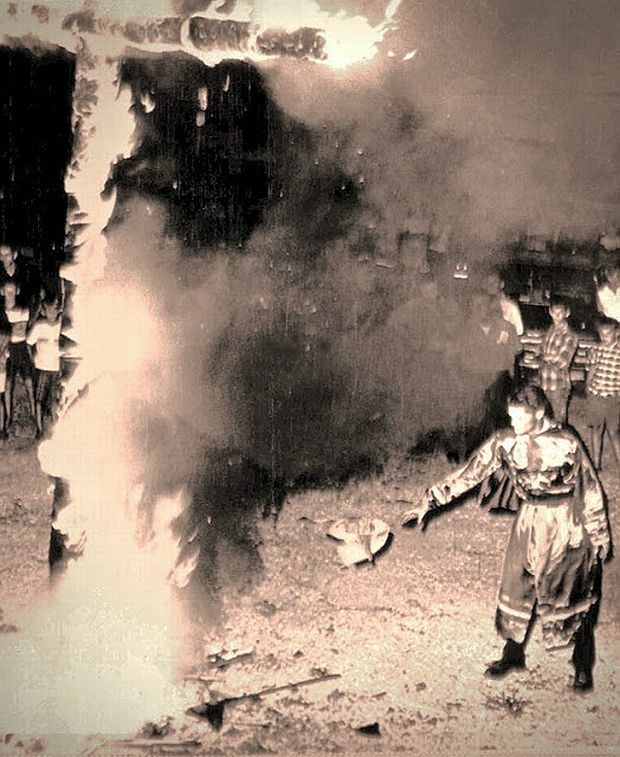 August 15, 1966: UPI wire photo showing Donna Woods of Longview, Texas applying torch to pile of Beatles material, ending a 10-day “Burn the Beatles” campaign. On the same day that thousands of fans were cheering the Beatles in Chicago, radio station KLUE-AM in Longview, Texas organized one of the “Beatles bonfires” (shown at left). 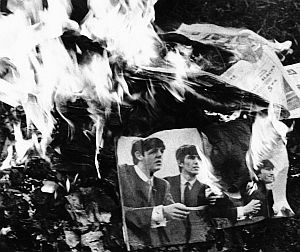 For that event, ex-Beatle fans over a ten day period brought their Beatles records and other memorabilia to be burned in protest. In addition, by August 13, the music industry magazine, Billboard, was also reporting that a number of radio stations were calling for a ban on Beatles music. Some twenty-two radio stations by that date, mostly in the South, had begun to boycott Beatles music. Billboard also noted that New York’s WABC station had then reportedly put Beatles records on a “no play” list. Meanwhile, back in Birmingham, Alabama, where the “Ban the Beatles” campaign had begun, WAQY disc jockey Tommy Charles said in a statement of August 12th that he accepted Lennon’s apology made at the Chicago press conference, and that Charles would call off the Beatles bonfire that had been scheduled there for August 19th. And at their first performances on the 1966 tour, The Beatles appeared to be doing quite well, playing to full venues, at least in Chicago, as shown in the photograph below. August 12th, 1966: The Beatles in Chicago at the International Amphitheater, first stop on their 1966 American tour, taking a bow on stage after their performance, which appears to have drawn a full house. For the third city on their concert tour, the Beatles were scheduled for one show in Cleveland, Ohio on August 14th at 7:30pm at Cleveland Stadium, then also known Lakefront Stadium or Cleveland Municipal Stadium. AAP-Reuter wire story on Cleveland pastor who told his parishioners they would be expelled from the church if they attended Beatles concert. However, on the day of that concert, Sunday morning, during church services at Cleveland’s New Haven Baptist Church, Rev. 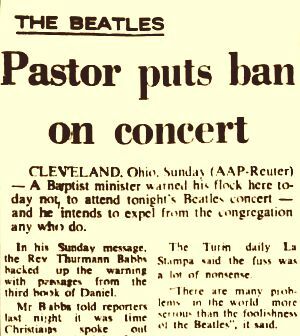 Thurmann H. Babbs warned his parishioners that if they attended the Beatles concert that evening he would expel them from the congregation – and he backed up his warning by reading passages from the third book of Daniel. The previous evening, Rev. Babbs had told reporters that he felt it was time for Christians to speak out against John Lennon’s remark that the Beatles were more popular than Jesus. In Cleveland, meanwhile, it is not known how many members of Rev. Babbs’ congregation did not attended the Beatles concert, but there were some 20,000 or so fans in Cleveland who did go to that concert. 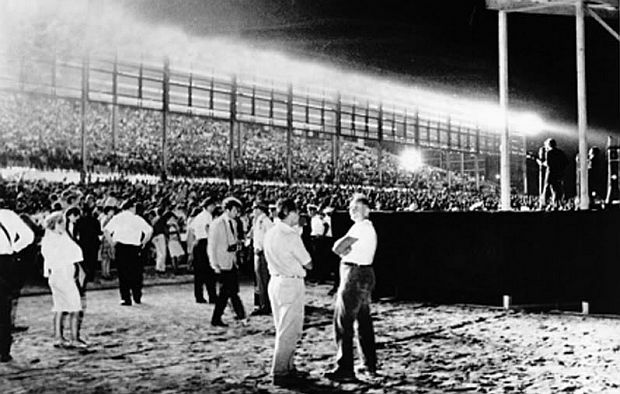 In fact, during that show, about 3,000 of the more enthusiastic fans in Cleveland broke through a four-foot security fence around the stage area just as the Beatles played “Day Tripper.” The police were overwhelmed, and stood back as fans ran over the stage and surrounding grassy area. The Beatles sought refuge in their caravan/trailer dressing room behind the stage. The concert was halted for about 30 minutes until police reinforcements arrived to restore order. Still, as reported by Beatles media manager, Tony Barrow, at the end of that show some fans tried stealing Beatles instruments from the stage as souvenirs. Washington., D.C., August 15, 1966: Beatles press conference in Washington Senators’ baseball locker room, prior to show. On a personal level, Lennon was genuinely concerned about the reaction to his remarks. The Beatles Bonfires were especially unsettling. “….But the record burning. That was the real shock, the physical burning. I couldn’t go away knowing that I created another little piece of hate in the world.“….But the record burn-ing. That was the real shock, the physical burn-ing. I couldn’t go away knowing that I created another little piece of hate in the world….” Especially with something as uncomplicated as people listening to record and dancing and playing and enjoying what the Beatles are. Not when I could do something about it. Lennon, like other twenty-somethings of his day, searching for spiritual meaning, and was reading extensively about religion, as the Cleve article noted. He and other Beatles, like thousands of other young people at that time, were searching in various venues –eastern and western – for spiritual meaning and guidance… For Some / some ventured This became part of the psychedelic and transcendental movements… The Beatles would go to India, in fact, two years later in search of spiritual guidance. Source: Leroy Aarons, “‘Can’t Express Myself Very Well’, Beatle Apologizes for Remarks,” The Washington Post, August 15, 1966, p. A-1; and Leroy Aarons (Washington Post News Service), “Beatle Tells How Religion Got Into Act,” August 16, 1966. Portion of front page of the August 17th, 1966 metro edition of The Miami News has Beatles’ Philadelphia concert story & photo appearing below Vietnam War-related headline. 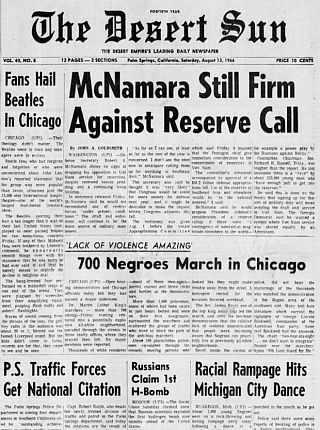 Portion of front page from Aug 13th Desert Sun (Palm Springs, CA) noting Beatle’s earlier concert in Chicago (left column), amid other news on Vietnam (McNamara headline) and lower on page, civil rights march and “racial rampage” stories . 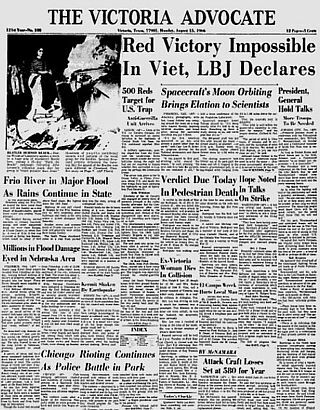 Texas newspaper, ‘The Victoria Advocate’ of August 12th, 1966, features ‘Beatles Bonfire” photo on its front page, but also a dominant LBJ/Vietnam War headline, and lower on page, story headline about race-related rioting in Chicago. In Philadelphia, the Beatles performed one evening show on Tuesday, August 16th 1966, at the John F. Kennedy Stadium, before an audience of 20,000, which was about a third of that venue’s capacity. Beatle John Lennon’s remarks about Christianity and his subsequent apology apparently haven’t dampened the enthusiasm of the quartet’s fans, their cheers indicated last night. And a sampling of fans, most of whom said they weren’t offended by his first remarks, stood up for this right to speak his mind about the popularity of Christianity and rock n roll music. The Beatles, of course, were not the only news of the day, as larger issues loomed for the nation and the world. In fact, while reporting on the Beatles’ tour during August 1966 often appeared on the front pages of American newspapers, and those around the world, there were also more dire news reports on those front pages – notably headlines about the Vietnam war or racial strife in American cities, as American involvement in the war and civil rights issues were both pressing issues of the day. 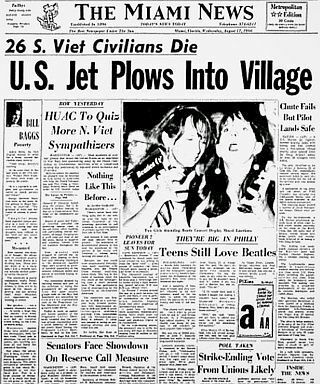 In The Miami News of August 17, 1966, for example, a front-page story appeared on the Beatles in Philadelphia with a photo of two female Beatles fans and front-page headline noting: “Teens Still Love Beatles: They’re Big in Philly.” But the big lead headline in that Miami News edition that day was about a military jet in Vietnam slamming into a Vietnamese village. At the Beatles earlier shows on the tour as well, newspapers had Beatles stories on front pages that also carried news about Vietnam War related issues, civil rights marches, and/or racial strife. The front page of the August 13th, 1966 Desert Sun of Palm Springs, CA, for example (above right), noted the Beatles’ earlier August 12th concert in Chicago (left news column), amid related news on Vietnam War (McNamara headline) and a Civil Rights march (lower on page). 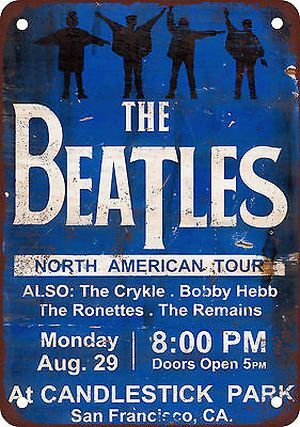 Back on the Beatles tour, meanwhile, on Wednesday, August 17th – one day after their show in Philly – the Beatles were scheduled to performed two shows at the Maple Leaf Gardens in Toronto, Canada. The first show took place at 4 pm and was seen by 15,000 people and the second began at 8 pm and was attended by 17,000. In Boston, on Thursday, August 18th, 1966, their seventh stop, the Beatles played one show at Suffolk Downs, a horse race track. That concert began at 8 pm, and went off without incident, save a few fans who tried reaching the performers on stage. Among the 25,000 attending the Boston show were 13 year-old Joseph and 15 year-old Kathleen Kennedy, teen children of Robert and Ethel Kennedy, along with 33 other friends and Kennedy family members who had driven up from Hyannis Port, Massachusetts for the show. According to The Boston Globe, the Kennedy group had a block of seats in the front section of the venue. 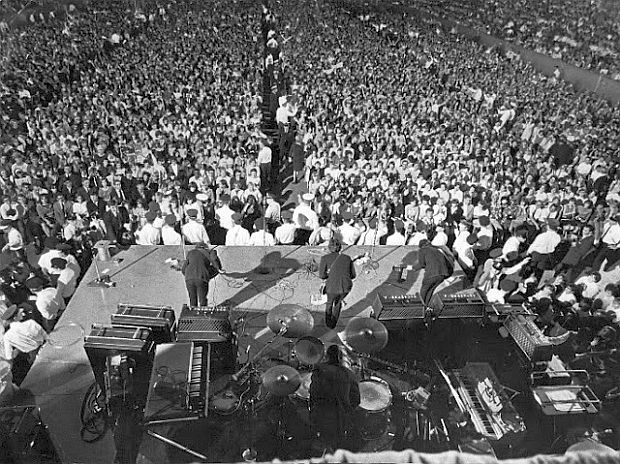 On August 18, 1966 the Beatles performed one show in Boston, MA at the Suffolk Downs Racetrack, as this photo shows the Beatles performing, far right, on a make-shift stage set up on the race track turf, facing the grandstand audience. The most southern of the venues for the Beatles’ 1966 American tour was the Mid-South Coliseum in Memphis, Tennessee, where they were slated to perform two shows on Friday, August 19th, at 4:00 and 8:30 p.m. When Lennon’s “more popular than Jesus” remarks had first broke, the mayor of Memphis, William Ingram, sought to have them banned from performing in the city. He asked the city council to request that the Beatles withdraw from their performance contract, which the Beatles would not do. Instead, the mayor and board of commissioners adopted a unanimous resolution on August 10th to express “official disapproval,” and “advise the Beatles that they were not welcome in the City of Memphis.” Brian Epstein, meanwhile, tried to quell their concerns with a telegram to Mayor William Ingram that read: “I wish to assure yourself, the people of Memphis and the Mid-South, that the Beatles will not, by word, action or otherwise in any way offend or ridicule the religious beliefs of anyone… Furthermore, John Lennon deeply and sincerely regrets any offense he many have caused.” The Beatles had also considered at one point that they might arrange for a recording session at the famous Stax music studios in Memphis, but that deal was never completed. August 2006 story by John Bifuss for ‘The Commercial Appeal’ newspaper of Memphis 40 years after the Beatles visit recalls “the icy reception” they received from city fathers. 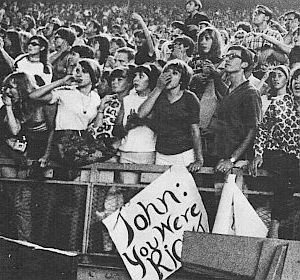 At the time of the August 18th concerts in Memphis, however, the anti-Beatles sentiment over Lennon’s remarks was still strong in the area. A local preacher, the Reverend Jimmy Stroad, staged a rally outside the Coliseum. There were also six members of the Ku Klux Klan who picketed the venue wearing full robes. Just before their first show in Memphis, the Beatles received an anonymous phone call warning them that at least one of them would be shot on stage, and a bomb scare caused an hour delay in the first show while authorities checked the facility. Still, the Beatles proceeded with their performances. Midway through the evening show, however, a lit cherry bomb was thrown on stage, frightening them, each thinking one of them had been shot. This incident, among others, was one of those contributing to the Beatles rethinking their career plans, and live touring in particular. 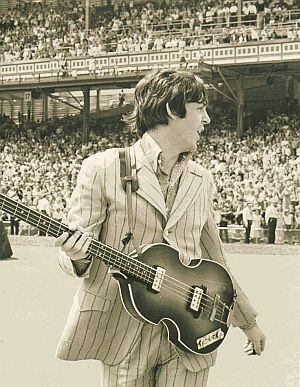 August 1966: Paul McCartney walking toward an infield stage at Crosley Field, Cincinnati, Ohio. August 20, 1966: Ren Grevatt's column, for UK's ‘Melody Maker’ magazine, was also reporting that Beatles music was receiving air play. Meanwhile, by August 20, Billboard magazine was reporting that a number of Hot 100 “powerhouse” radio stations – those in big markets – were not involved in any Beatles boycotts, and in fact, were playing Beatles music as part of their regular programming. Among these stations were: KIMN in Denver; KLIF in Dallas, Texas; KDWB in Minneapolis; EFUN in Miami; WDKO in Louisville; KDKA in Pittsburgh; WCBG in Chambersburg, PA; WPRO in Providence, Rhode Island; and EMCA in New York. The Chambersburg, Pennsylvania station, in fact, aired an editorial supporting the Beatles. And according to Capitol Records, Southern stations were also among those playing Beatles music, including WMPS in Memphis; WAPF in Jacksonville, Florida; WVOK in Birmingham, Alabama; WBAM in Montgomery, Alabama; and WFLI in Chattanooga. The Beatles’ St Louis concert had been expected to sell out in the brand new, three-month old Busch Stadium. But ticket sales had slowed there when Lennon’s comments about Christianity first broke, although picked up again as the controversy cooled. Still, before the concert began, some 85 people from two Baptist churches distributed 20,000 pamphlets on the Lennon statement. The Rev. Bob Wright of the First Baptist Church in Ferguson said his membership tried to take a positive approach, as the pamphlets acknowledged there was an element of truth to what Lennon had said, but that popularity was fickle, and that those who once praised Christ were also those who later demanded his crucifixion. The Christian pamphleteers, however, were not always well received by many of the St. Louis concert goers. 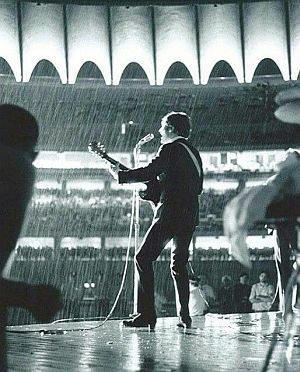 John Lennon shown performing during the rain storm at the Beatles' St. Louis concert, August 21, 1966. …It rained quite heavily, and they put bits of corrugated iron over the stage, so it felt like the worst little gig we’d ever played at, even before we’d started as a band. We were having to worry about the rain getting in the amps and this took us right back to the Cavern days – it was worse than those early days. And I don’t even think the house was full. I finally agreed. I’d been trying to say, ‘Ah, touring’s good and it keeps us sharp. We need touring, and musicians need to play. Keep music live.’ I had held on that attitude when there were doubts, but finally I agreed with them. …But now even America was beginning to pall because of the conditions of touring and because we’d done it so many times. After the St. Louis concert, the Beatles took a night flight to their next stop, New York city, arriving there in the wee hours of August 22nd, at 3:50 a.m. They lodged at the Warwick Hotel, where they gave a press conference the following day (and also a junior press conference for teens). 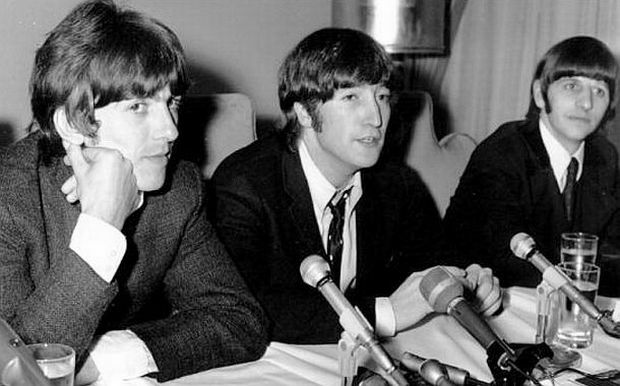 At the main press conference, John and George came out against the war in Vietnam, and war in general, and John was reluctant to answer any more questions on his Christianity remarks, feeling played out on the subject, with nothing new to say. Some concern arose when two teenage girls, who walked out on to a 21st story building ledge of the nearby Americana Hotel, threatened to jump unless they met the Beatles. The two were rescued by New York police. 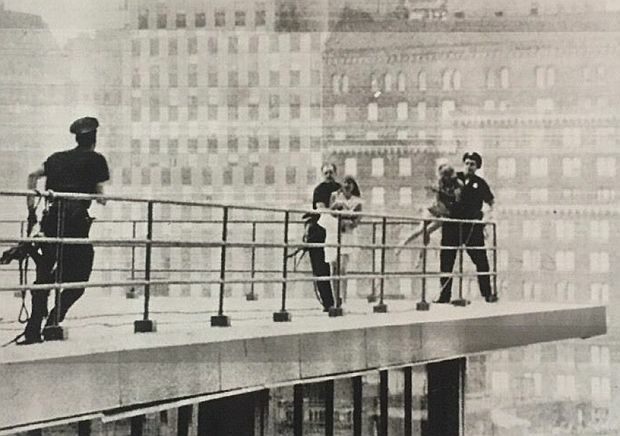 August 22, 1966: New York city police rescue two teenage girls on the 21st story of the Americana Hotel who threatened to jump 'unless we get to see the Beatles,' who were in the Warwick Hotel, a block away. AP wire photo. The following day, on August 23rd, the Beatles did their show at Shea Stadium, which a year earlier was among their biggest and most successful venues. This time, however, their August 23rd show did not sell out, with 11,000 of the 55,600 tickets still available. Still, the Beatles made more money from this appearance than they did their previous Shea concert, receiving $189,000 – which was a 65 per cent cut of the $292,000 gross. Some of those traveling with Beatles, such as Judith Sims, editor of TeenSet magazine, thought the New York concert was one of the most exciting of the 1966 tour. During the performance hundreds of fans broke through barriers at one point and attempted to reach the stage. They were held back by security guards and none managed to reach The Beatles. Following the New York show, the Beatles flew to Los Angeles where they rented a home on Curson Terrace in the Hollywood Hills of Los Angeles to use as a West Coast base and a more amenable non-hotel retreat, as they finished up their last three show dates scheduled for Seattle, L.A., and San Francisco. 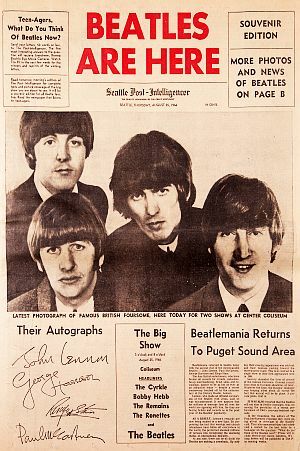 Special souvenir Beatles edition of the 'Seattle Post-Intelligencer' newspaper for the Beatles' August 25th, 1966 concerts in Seattle, Washington. …Lennon, who made an offhand comparison of the Beatles with Jesus, said he was misunderstood. It now appears that his millions of teen-age fans all over the world are agreeing with him, for they are buying tickets and records as in the peak year of the Beatles’ popularity. As a result, Lennon’s remarks are now being studied in a new light. By pinpointing the fact that worship and church attendance have fallen off everywhere in the world, the performer shocked millions of persons into recognizing the alarming status of international morality. Ticket for the Beatles Thursday, August 25th, 1966 concert at the Seattle City Center Coliseum, 3 pm. In addition, as the Beatles’ evening show ran, the Reverend Thomas Miller, Pastor of the Calvary Bible Presbyterian Church, arranged for a concert of sacred music in the Rainier Room at the Coliseum, at which some 250 attended. Yet earlier that day, each of the Beatles had been presented with official certificates designating them honorary citizens of the state of Washington. For the Beatles’ first Seattle show at 3 pm, about half of the Coliseum was filled – roughly, 8,200 seats in a 15,000-seat arena. The evening show, however, was a sell-out with the gross gate for both shows reported at $118,071 (nearly $900,000 in today’s money) – then “the biggest single day’s gross ever in (Seattle’s) entertainment history,” according to Zollie M. Volchok, for the sponsoring agent. Of that amount, the Beatles received some $73,717.81 for the two shows (about $560,000 in today’s money). Following the evening show that night, the Beatles and their supporting acts flew back to Los Angeles. August 24th, 1966: Beatles at the Capitol Records Tower Building in Los Angeles, for press conference and to receive Gold Record award. In Los Angeles, the Beatles stay had two parts. On the 24th of August, 1966, ahead of their Seattle show date, the Beatles had some time to themselves, but also held a press conference that day at the Capitol Records Tower building in Los Angeles. 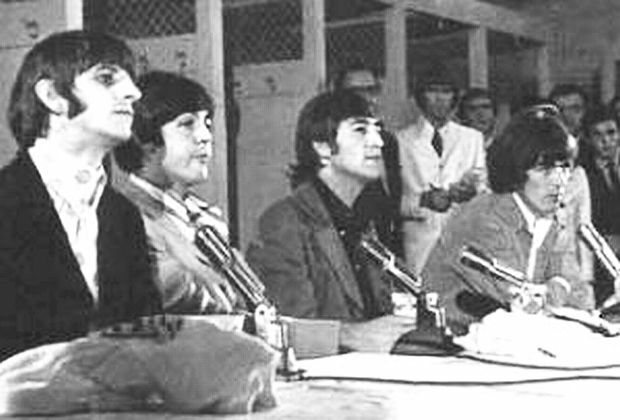 During the press conference, they were asked again about Lennon’s “more-popular-than-Jesus” remarks, which Lennon, now tired of explaining himself, begged off once more, saying he’d tried clarifying it “about 800 times, you know.” They were also asked if the controversy had hurt of helped their careers, to which Paul replied: “It hasn’t helped or hindered it, I don’t think. I think most sensible people took it for what it was… and it was only the bigots that took it up,” thinking it was something they might “get the Beatles” on, trying to cast John as arrogant in the process. And that once people read it, “they saw that there was nothing wrong with it really.” Meanwhile, at the Capitol Records building following the press conference, the Beatles were also awarded Gold records by Capitol and RIAA for their latest album, Revolver. August 28th, 1966: The venue at Dodger Stadium in Los Angeles, where the Beatles and their opening acts appeared on a temporary stage constructed just behind second base on the edge of center field, then typical of early stadium set ups, which many performers felt as remote from their audience. On the second part of their L.A. stay, after their Seattle show, the Beatles had some time off prior to their August 28th show at Dodger Stadium. They used the time to relax at their rented home with swimming pool in the Hollywood Hills, and also to visit with other musicians who lived and worked in the L.A. area. Among those that one or more of the Beatles met with informally at various homes and other locations during this time (along with Barry Tashian of the Remains on some visits), were: Brian and Carl Wilson of the Beach Boys; David Crosby, then with the Byrds; Cass Elliott, Michelle Phillips, and Denny Doherty of The Mamas & The Papas; photographer Barry Feinstein and his wife, Mary Travers, of Peter, Paul & Mary; Jim McGuinn (known as Roger McGuinn, then with Byrds); Peter Tork of The Monkees, and others. A number of these artists that year, had or would have, top charting hits of their own, including, for example: “Eight Miles High by the Bryds”(No. 14, April-May); “Monday, Monday” by The Mammas & The Papas (No. 1, May-June); “Wouldn’t It Be Nice” by the Beach Boys (No. 8, Aug-Sept ); and, “Last Train to Clarksville,” by The Monkees (No.1, Oct ). 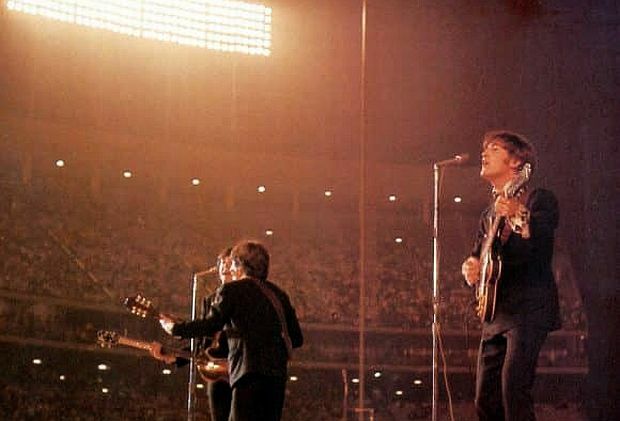 August 28th, 1966: The Beatles performing at Dodger Stadium, from left: Paul McCartney, George Harrison, and John Lennon. Not shown, drummer Ringo Starr, set up behind the three frontmen, outside of the photo's right frame. San Francisco was the last stop for the Beatles’ 1966 American tour – and as it turned out, it would also be the last time they would ever appear publicly in a live concert format. Few of their adoring fans knew that at the time, but the Beatles certainly did, and they were happy to be at the end of their 1966 tour. Back stage, before the show began, there were some visits from American musicians – Joan Baez, her sister, and a teen neighbor visited with George and Ringo briefly. August 29th, 1966: Pickets from Sunnyvale, CA outside Candlestick Park protest John Lennon's "more-popular-than-Jesus" remark. These demonstrators were seen by some concert goers, but missed by the Beatles, who used a different entrance. AP photo. In San Francisco, the Beatles and their opening acts were again playing in a baseball stadium set up, this time Candlestick Park, home of baseball’s San Francisco Giants, a stadium known for its sometimes finicky and chilly winds. The stage, once again, as in the other stadiums, would be set up behind second base, well away from fans, and surrounded by fencing. 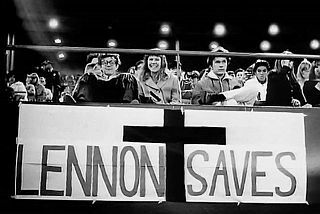 Some Beatles fans inside Candlestick Park offered home-made signs of cheeky support for John Lennon, like this one. At Candlestick, the Beatles played their 30-minute set of tunes – “Rock and Roll Music,” “She’s A Woman,” “If I Needed Someone,” “Day Tripper,” “Baby’s In Black,” “I Feel Fine,” “Yesterday,” “I Wanna Be Your Man,” “Nowhere Man,” “Paperback Writer,” and “Long Tall Sally.” Their share of the gate that night was about $95,000 (roughly $725,000 today). For the entire tour – 19 shows in 14 cities – they would make something in the vicinity of $4 million ($30 million today). At the end of the San Francisco show that night, the Beatles and their opening acts flew back to Los Angeles, and the following day, August 30th, the Beatles flew home to England. It would prove to be the end of an era for them, and in many ways also, a beginning for more sophisticated rock music and better quality rock concerts. 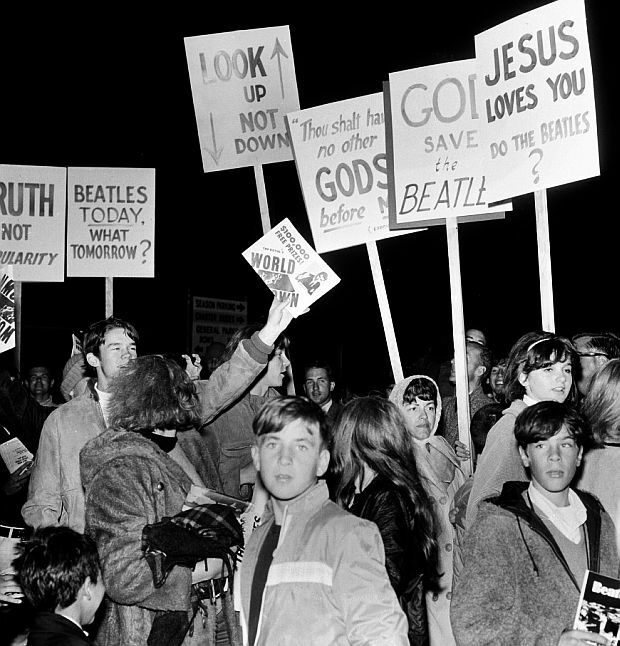 As for the Jesus controversy that had dogged the Beatles from late July 1966 throughout their August tour – with Beatle bonfires, radio station protests, threatening messages, endless questions from the press, some picketing, etc – the uproar did not really have a “material effect” on the Beatles fan base or their business. True, their popularity may have been temporarily dented and their activities more closely examined. And there were a couple dozen or more radio stations that did boycott Beatles music for a time. Yet it appears they were the exception, as most U.S. radio stations ignored the boycott, while those who did boycott, later returned to playing Beatles music. And yes, attendance was down in a few of the concert venues on the 14-city tour that August – but overall, the Beatles still appear to have drawn record numbers at these concerts for the most part. Nor did their record sales appear to be noticeably affected. 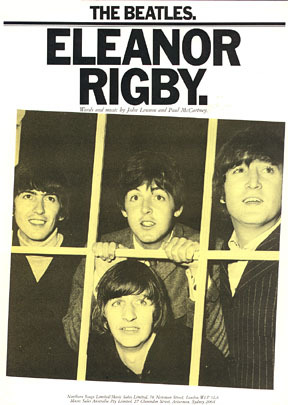 “Eleanor Rigby” sheet music cover. Click for separate story on “Eleanor Rigby” song, a Beatles hit in 1966. In fact, while they were on tour, their single, “Yellow Submarine”/“Eleanor Rigby,” released on August 5th, was being played regularly by many Top 40 American radio stations and became the No. 1 hit in the U.K. within a week. By the end of the month, this single would also hit No. 1 in the Los Angeles market and reach No. 11 nationally, on the Billboard Hot 100. (However, there were also reports that Capitol Records was wary of religious references in “Eleanor Rigby,” given the Jesus controversy, and favored “Yellow Submarine” in some of its marketing and promotion). The studio album, meanwhile, Revolver – which was released on August 5th in the U. K. and August 8th in the U. S., at the very outset of the Jesus controversy – also managed to scale the pop charts. 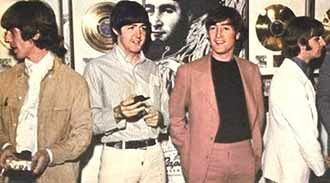 Revolver sales, in fact, would reach $1 million in the first two weeks, with the album hitting No. 1 on the American charts by September 10th and remaining there for six weeks. The Jesus controversy, meanwhile, would still sprout up on occasion in subsequent years, and there would also be some enterprising research analysts and graphics artists who set out to investigate whether, in fact, the Beatles really were more popular than Jesus (one suggested they were not, for example, with Bibles sold outdoing Beatles albums sold). A photographer's film contact sheet showing a series of headshots of the Beatles as they were performing at Candlestick Park, San Francisco, August 1966 – from left: Ringo Starr, George Harrison, John Lennon, and Paul McCartney. But the central problem for the Beatles on tour was what the craziness was doing to their advancement as musicians. They had been trapped by Beatlemania; for three years playing essentially the same music. And on tour, especially in stadiums, the sound quality of what they did play — when any sound could be heard — wasn’t very good. They weren’t happy with that, of course. Having worked in the studio, discovering news ways to produce more sophisticated music – like that on Revolver – they wanted more of that and more advancement for themselves as musicians. In fact, the Beatles had actually begun a new phase of their careers in late 1965 – before they began the 1966 tour – with their Rubber Soul studio album (released December 1965). But as they were breaking new ground in the recording studio, on the road they were playing the same old hits at teenage rock shows, and that was holding them back. So for them, touring was over and done with. They would now turn their energy and talents toward the recording studio, and along with their producer, George Martin and his engineers, the Beatles would become a powerhouse of studio production and innovation. From the Beatles’ “Sgt. 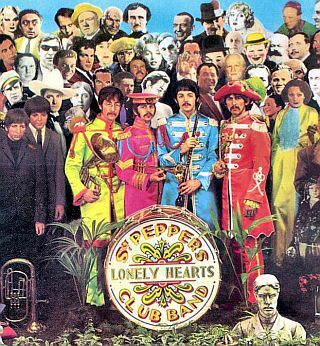 Pepper’s” album, May 1967. Additional history on the Beatles at this website can be found at the “Beatles History” topics page, which includes more than a dozen story choices on Beatles music, song histories, and Beatles’ biography. See also the “Annals of Music” page for additional stories. August 1966: Beatles material aflame in a bonfire of protest following John Lennon's "more-popular-than-Jesus" remarks. August 20, 1966: UPI story from Pittsburgh Post Gazette suggesting Beatle critics could have been more Christian. 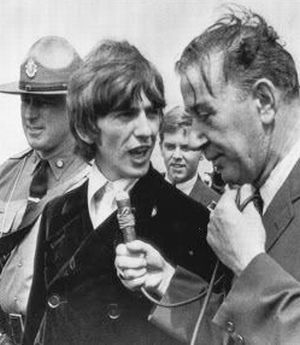 August 11th, 1966: Beatle George Harrison quizzed by reporter on tarmac at Boston’s Logan Airport as Beatles made connecting flight to Chicago to begin their American concert tour. August 12th, 1966 AP story appearing in The Miami News (FL) on John Lennon’s apology at Chicago press conference. Ticket for Beatles' concert at Washington, D.C., Aug 15th, 1966. August 21st, 1966. 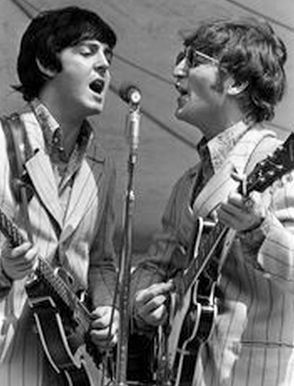 Paul McCartney and John Lennon per-forming at rescheduled Crosley Field concert, Cincinnati. Ticket for Beatles' August 1966 concert, Cincinnati, Ohio. 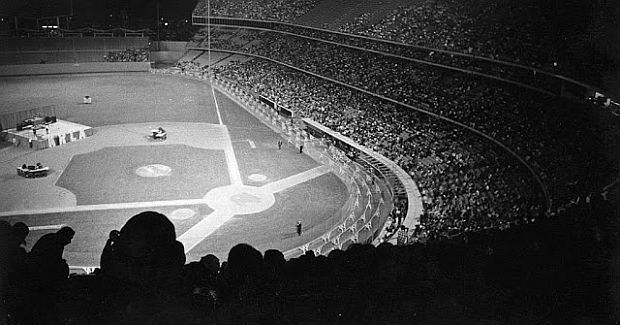 Portion of the crowd that turned out for the Beatles' August 23rd, 1966 concert at New York's Shea Stadium. Poster image advertising Beatles’ August 29th, 1966 concert at San Francisco’s Candlestick Park. 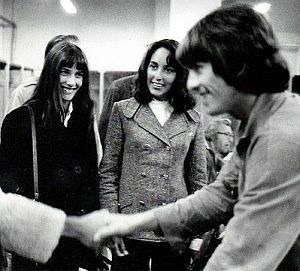 Aug 29th, 1966: Joan Baez, center, with sister Mimi Farina, backstage at Candlestick Park; George Harrison in foreground. Baez also brought along 10 year-old neighbor, Naomi Marcus, to meet the Beatles. Ticket for the Beatles' August 29th, 1966 concert in San Francisco at Candlestick Park. 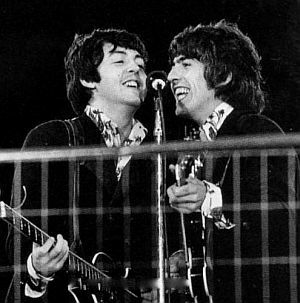 August 29th, 1966: Paul McCartney and George Harrison performing at Candlestick Park in what would be the last time the Beatles would perform together in a public concert. Maureen Cleave, “How Does a Beatle Live? John Lennon Lives Like This,” Evening Standard (London), March 4, 1966. “I Don’t Know Which Will Go first – Rock n Roll or Christianity,” Datebook (republished edition of Maureen Cleave story above), September 1, 1966 (story was available to press late July 1966). Associated Press (Birmingham, AL), “Beatle Ban: ‘Christianity Will Go’ Comment Stirs up Fans,” Ottawa Citizen (Canada), August 3, 1966, p.3. Associated Press (AP), “Stations Ban ‘Sacrilegious’ Beatles; Singer’s Claims Bring Actions,” The News and Observer (Raleigh, North Carolina) August 4, 1966, p. 14. Associated Press, “Beatles Ban Gains Ground,” The Daily Iowan (University of Iowa), August 4, 1966, p. 1. Peter J. Shaw, United Press International (UPI), “Christianity Will Go, Says Prophet Lennon; Beatles ‘More Popular Than Jesus’?” The Republic (Columbus, Indiana), August 4, 1966, p.12. Associated Press, “Comment on Jesus Spurs a Radio Ban Against the Beatles,” New York Times, August 5, 1966. “Beatles Manager Here to Quell Storm Over Remark on Jesus,” New York Times, August 6, 1966. 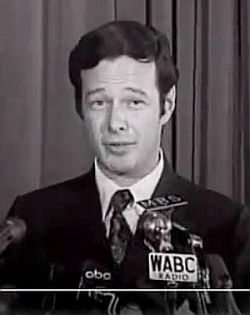 “Brian Epstein, Americana Hotel, August 6, 1966 N.Y.C.” (Press conference re: John Lennon’s remarks), YouTube.com, posted by Godzzzila69, May 30, 2014. A.A.P., (London, U.K.), “Bonfire of Beatles’ Records”(radio station WPXE at Starke, Florida), The Sydney Morning Herald (Sydney, Australia), August 7, 1966, p. 17. Damian Fanelli, August 8, 1966: “Hundreds of Beatles Records Are to Be Pulverized in a Giant Municipal Tree-Grinding Machine,” Guitar World, posted August 5, 2015. Wire Dispatches (London, U.K.), “Beatles Face Hornet’s Nest; Fans Threaten War”(unnamed newspaper), August 10, 1966. David Frost, The Press, “John’s Gospel,” The Spectator, August 11, 1966, p. 10. UPI, “Stock in Beatle Songs Is Cheaper in London,” New York Times, August 11, 1966. UPI, “Lennon of Beatles Sorry for Making Remark on Jesus,” New York Times, August 12, 1966. 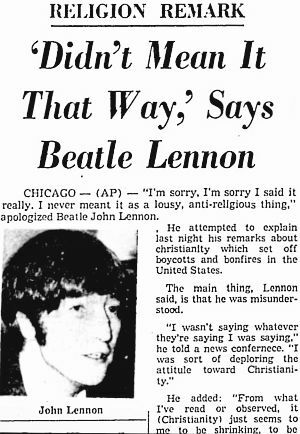 AP (Chicago), “John Lennon Apologizes for Statement,” The Morning Record (CT), August 12th 1966. UPI (Chicago), “Beatle Sorry, But Popularity ‘True’,” August 1966. Meredith Eiker, “The Beatles Versus God: Religion Hippy Style,” The Michigan Daily (Ann Arbor, MI), August 12th 1966. Associated Press (Boston), “Solon Would Bar Beatles From Boston,” The Nashua Telegraph (Nashua, New Hampshire), August 12th 1966. Gerald R. Thorp, “Beatle Ticket Sales Pick Up After Slowdown,” St. Louis Post-Dispatch, August 13, 1966. AP, “Just the Usual Din As Beatles Open Tour in Chicago,” New York Times, August 13, 1966. “Stations No, No Beatles Disks,” Billboard, August 13, 1966, p. 4. “Lennon Comments Regarding ‘Jesus and Christianity’ Sparks Outrage, Group’s Music Airplay Ban Across U. S.,” Billboard, August 13, 1966. UPI, “Vatican Accepts Lennon’s Apology,” New York Times, August 14, 1966. “Beatles Suffering From Crack In Their Image; How Will U. S. Tour Turn Out?,” The Cincinnati Enquirer, Monday, August 15, 1966. AP (Cleveland, OH), “Ohio Fans Chase Beatles From Stage,” The Spokesman Review (Spokane, WA), August 15th, 1966, p. 7. Art Buckwald, “Plain Blasphemy; Burn, Beatles, Burn!,” The Milwaukee Sentinel, August 16, 1966. Editorial, “What He Meant Was…,” New York Times, August 16, 1966. “The Beatles Beat a Retreat From Fans in Cleveland,” New York Times, August 16, 1966. “Guarded Beatles Whisked to Hotel On Arriving Here for Stadium Show,” The Washington Post, August 16, 1966, p, A-1. AP (Washington, DC), “The Beatles A Smash in D.C., Lennon Grateful to The Vatican,” The Miami News (FL), August 16th, 1966. UPI, “Beatles Lure Big Crowd,” The Spokane Daily Chronicle (Spokane, WA), August 16th, 1966. Raymond J. Crowley, AP, “Amid Cheers, The Beatles Steer Clear of Theology Pittfalls,” The Fort Scott Tribune (Kansas), August 16th, 1966. AP (Washington, DC), “Beatles Carefully Keep Clear of Own Theology In Their American Tour,” The Lawrence Journal World (Lawrence, KS), August 16th, 1966. Art Buckwald, “Burn, Beatles, Burn, I Cried,” The Miami News (Florida), August 17th 1966. “Fewer Fans, Fainters — But Beatles Took $96,000,” The Toronto Daily Star (Tornoto, Canada), August 18th, 1966, p. 1. Associated Press (Toronto), “Beatles Heard on War Views,” The Spokane Daily Chronicle (WA) August 18th, 1966. Sara Davidson, “25,000 Teens Cheer Beatles at Suffolk,” The Boston Globe, August 19th, 1966, p. 1. 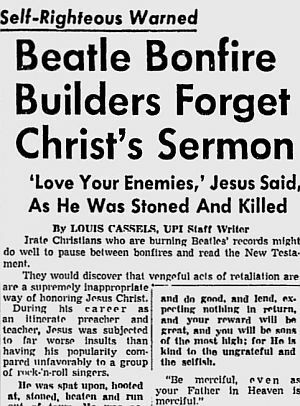 Charles McDowell, Jr., “Kookiness And Beatle Theology,” The Evening Independent (FL), August 20th, 1966. Times Wire Service, “Memphis De-Emphasizes Beatles,” The St. Petersburg Times (FL), August 20th, 1966. UPI (Memphis), “Beatles Outdraw Religion,” The Dispatch (North Carolina), August 20th, 1966. UPI, (Memphis), “Debris Is Hurled at Beatle Concert,” New York Times, August 20th, 1966. UPI (Memphis), “Beatles Show Outdraws Church Rally,” The Reading Eagle (Reading, PA), August 20th, 1966. 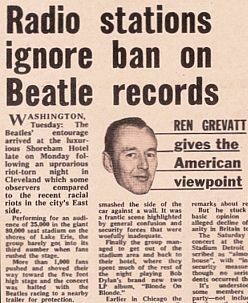 Ren Grevatt, American Viewpoint, “Radio Stations Ignore Ban On Beatle Records,” Melody Maker, August 20th, 1966. Claude Hall, “Beatles Running Strong — With Powerhouse Stations’ Blessings,” Billboard, August 20th, 1966. Robert K. Sanford, “The Beatles Sing in the Rain for Wet, Enthusiastic Audience; 23,000 Pay to Hear them – Firs Air Stations Busy,” St. Louis Post-Dispatch, August 22nd, 1966, p. 1. Associated Press, “John Lennon Says He’s Hated, But Thousands Flock to Beatles’ Concert,” The Lawrence Journal World (Lawrence, Kansas), August 22nd, 1966. “Flock Circling Warwick A Harbinger of Beatles,” New York Times, August 22nd, 1966. Paul L. Montgomery, “The Beatles Bring Shea to a Wild Pitch of Hysteria,” New York Times, August 24th, 1966. Robert E. Dallos, “Beatles Strike Serious Note in Press Talk; Group Opposes the War in Vietnam as Being ‘Wrong’,” New York Times, August 23rd, 1966, p. 30. AAP-Reuter (Johannesburg, Sourth Africa), “Beatle Music Banned,” The Canberra Times (Australia) August 25th, 1966. “Beatles Storm Seattle,” Seattle Post-Intelligencer, August 26, 1966, p. 1. “6 Teenagers Defend Christ, Protest Beatles,” Seattle Post-Intelligencer, August 26, 1966, p.3. “Beatles Engaging; Show, Dull,” The Seattle Times, August 26, 1966, p. 26. “Beatles Planned No Religious Dispute,” The Seattle Times, August 26, 1959, p. 59. UPI (Los Angeles), “Screaming Teenagers Storm Beatles Car,” The Desert Sun (CA), August 29th 1966. AP, “Beatles’ Closing Concert On Coast Attracts 25,000,” New York Times, August 31, 1966. Leonard Gross (European Editor), “Beatle on His Own,” Look, December 13, 1966. “More Popular Than Jesus,” Wikipedia.org. “Beatles in the News,” blogspot.com. John C. Stoskopf, “The Beatles 1966 International Tour (Part 2 of 2),” Thursday, September 8, 2016. Barry Tashian, Ticket to Ride: The Extraordinary Diary of The Beatles’ Last Tour, August 1996, Dowling Press, 142pp (Tashain toured with the Beatles as a member of The Remains). “Friday, March 4, 1966: ‘We’re More Popular Than Jesus Now’,” The60sat50.Blogspot.com. Robert Fontenot, “…And Now It’s All This: Frequently Asked Questions About the Beatles’ ‘Bigger Than Jesus’ Controversy,” About.com, Updated March 3, 2015. Robert Fontenot, “The Beatles Backlash: Jesus, War, and Raw Meat: A Timeline of the Beatles in 1966,” About.com. Vince Kowalick, “25 Years Later: Recalling The Beatles’ Last Stand,” Los Angeles Daily News, September 3, 1991. Harry Sunrall (San Francisco), “Beatles’ Last Show A Hard Day’s Night,” The Canberra Times (Australia), September 1st, 1991. David Willey, “Vatican ‘Forgives’ John Lennon,” BBC News (Rome), November 22nd, 2008. Mark J. Price “Local History: Akron Radio Station’s 1966 Beatles Ban Recalled,” Ohio.com (Akron Beacon Journal), August 1st, 2011. Chris Erskine, “In 1966, the Beatles Brought a Whole New Ballgame to Dodger Stadium,” Los Angeles Times, August 26th, 2011. Brian Ward, “The ‘C’ is for Christ: Arthur Unger, Datebook Magazine and the Beatles,” Popular Music and Society, August 1st, 2012, pp. 541-560. Mark Murrmann, “Burn Your Beatles Records!,” Mother Jones, August 12th, 2014. Jordan Runtagh, “When John Lennon’s ‘More Popular Than Jesus’ Controversy Turned Ugly; How an Offhand Remark Led to Protests, Death Threats and the End of the Beatles’ Touring Career,” Rolling Stone, July 29, 2016. “Revolver, Jesus and the Beatles – August of ’66,” 1966myfavoriteyear.blogspot.com, Fri-day, August 5, 2016. Jeff Suess, “The Beatles, When They Played Crosley Field,” Cincinnati.com, August 19, 2016. “A Look Back at the Fab Four’s U.S. Tours,” The Orange County Register (California), September 16, 2016.